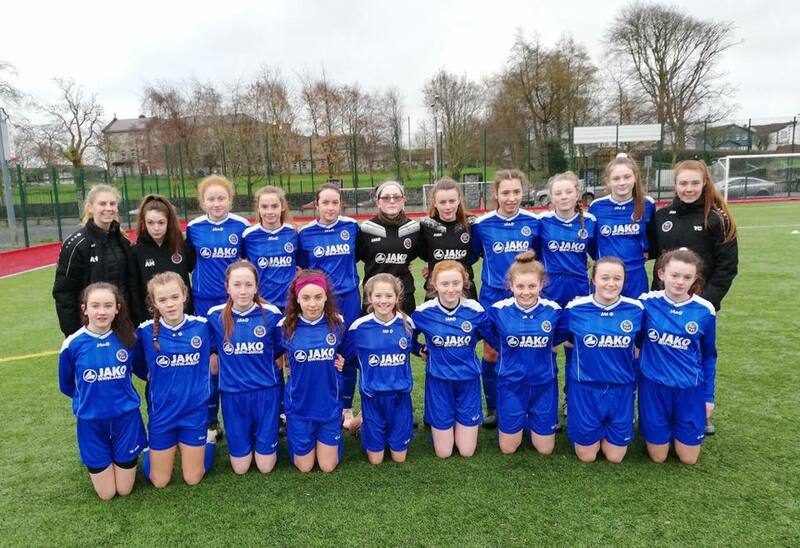 The Sligo-Leitrim Youths Schoolboys & Schoolgirls league Under 15 Girls had a good Gaynor Interleague win today at home to the Inishowen League. This was the 2nd of 5 Interleague games to determine qualification/seeding for the Gaynor Cup, S/L having won their opener in December away to the Mayo League. S/L started very brightly, the opening 10-15 minutes almost totally played in the Inishowen half of the pitch. Katie McGuire on the right wing applying a lot of pressure on the opposition and getting us in behind frequently, Maeve Molloy playing up top really stretching them and man-of-the-match Becky Doddy bossing the midfield briliantly right from the start. The reward came with about a quarter hour gone when Becky won ball in the middle, beat her player and slid a beautifully weighted pass inside for Maeve Molloy to control past the keeper and slot it home. With S/L rotating a few players for the last 15 of the 1st period Inishowen had a better spell then but strong defending all across the back, with Pixie O'Hara the architect of a lot of it, winning ball and smartly getting S/L going forward again time after time in the game. A good save too from Roisin Grennan in goal from an Inishowen corner keeping us ahead. The second half started in similar vein to the first - S/L pressing forward hard right from the start with some sublime passing football, and they struck within minutes, Katie McGuire splitting the defense with a great ball and Maeve Molloy again on the end of it to finish well. About 12 minutes into the half Erin Somers got on the end of a Becky Doddy corner with a header to put the Sligo-Leitrim girls 3-0 up and secure the game. Inishowen had a couple of chances late on but a couple of excellent saves from Macayla Burke kept it 2 clean sheets in a row for the home side. An excellent performance all-round from a talented S/L squad, two wins from two and the level of football on display very attractive to watch. TEAM: Roisin Grennan (Yeats Utd), Pixie O'Hara (Real Tubber), Maeve Casserly (Calry Bohs), Nadine Hargadon (Strand Celtic), Rianne Smith (Yeats), Aine Gorman (Capt: - Strand), Becky Doddy (Tubber), Katie McGuire (Yeats), Nola Eivers (Arrow Harps), Eimear McIntyre (V.Capt:- Ballisodare), Maeve Molloy (Ballymote), Lara Swann (Arrow), Erin Somers (Manor Rangers), Tara Casserly (Benbulben), Sorcha Feehily (Benbulben), Molly Mulhern (Arrow), Macayla Burke (Tubber), and Alicia Hogge (Ballymote).